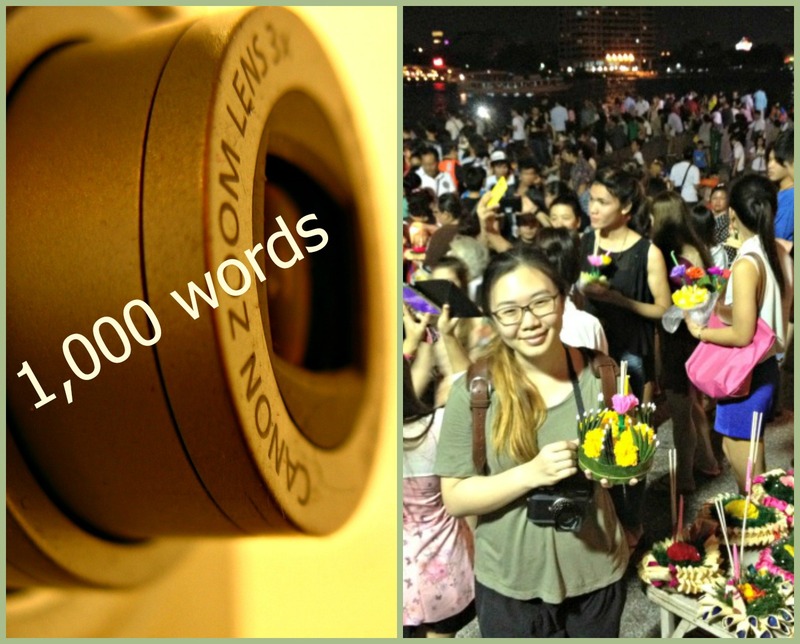 Canon zoom lens, photo credit: Morguefiles; Jamie in Bangkok, Thailand, for the Loy Krathong festival (November 2013). James King is back with his ever-popular “A picture says…” column. English by birth, James is now semi-retired in Thailand. If you like what you see here, be sure to check out his blog, Jamoroki. My March guest is 22-year-old Singaporean Jamie Chan. She shares stories and images from her travels on her blog, No Foreign Lands, while shooting or writing for clients in the photography, lifestyle or travel genres. Ever since she started photography in 2009, Jamie is rarely seen without a camera. Named one of Singapore’s 10 Best Young Photographers, she is an ardent traveler and enjoys documenting local cultures and lifestyles. A specialist volunteer for Singapore International Foundation and various animal welfare groups, Jamie also finds time for good causes. In addition, she sings in Schola Cantorum Singapore and plays the cello. She has clearly been allotted more hours than me in a day! Hi, Jamie, and welcome to TDN. I’ve been looking forward to this interview since I first saw your street photography. For one so young you have travelled a fair bit and captured some great images. Can you tell us where you were born and when you spread your wings to start travelling? I was born and raised on the sunny island of Singapore. My first solo trip was to Indonesia, when I was selected to be a photojournalist delegate of Singapore for the ASEAN Cultural Youth Camp of 2011, held in Yogyarkarta. At the time I was doing my final year project for my degree in Visual Communications (I majored in photography). After the camp finished, I decided to spend an entire month travelling around and documenting the culture and lifestyle of the peoples of Central Java. It was a big learning curve and stretched my photographic skills. I did not have the luxury of an editor to tell me what to look out for, and it was hard to get feedback from my lecturers because getting a wifi spot with Internet was like hitting the jackpot. The experience taught me to reflect, make decisions and work with what I had. I had to figure out how to shape and edit down my stories. You were only 19 then. How did your parents feel about your decision to travel solo? They were of course worried sick but came around eventually and even joined me for some parts of the trip. After all, what better way to spend time with your parents than on the back of a motorcycle going at God-only-knows what speed—’cause the speedometer was broken! That must have been some trip! So once you caught the travel bug, where else did you go? As a visual storyteller, I am always on the lookout for subjects that would make interesting photo essays. My blog, No Foreign Lands, started as a way to tell my mother that I was still alive while on the road. It has now become a platform for me to tell my stories and share my images with the world. Asia is one of my favourite places to travel. There is an incredible amount of interconnected history among the various countries. I am always learning. I agree. 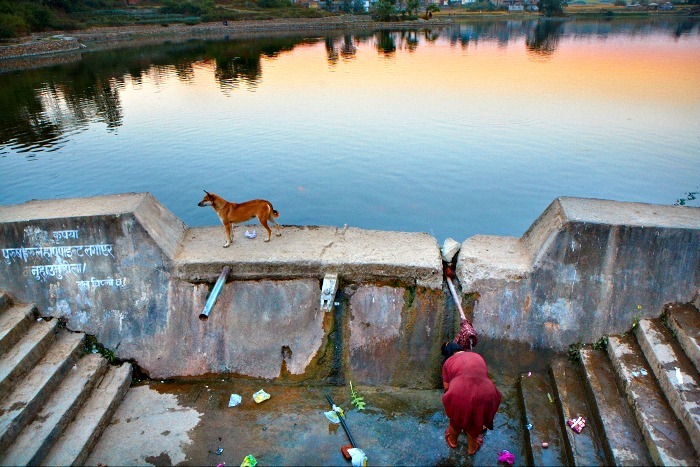 Asia is a treasure trove for us storytellers and photography buffs. I only wish I had started my travels at an earlier age. So which countries have you visited so far? I travel not to go anywhere, but to go. The great affair is to move. When I got back to Singapore after my Indonesia trip, I could not keep still. I was hooked on travelling, exploring and waking up to something new every day. I needed to move; soon after I graduated I booked my next trip—and I’ve never looked back since. Off the top of my head, I’ve been to Vietnam, Thailand, Malaysia, Nepal, Indonesia, India, China and Australia. That’s eight countries in less than four years; a lot more than most people visit in a lifetime. So tell us about where you are right now and why. I’m actually back home in Singapore! I’ll mostly be based here for the remainder of 2015. That said, I can never stay put for long—I’ve taken three trips out of the country this year and it is only March! I am in the midst of getting a certification for my Japanese-language studies which I hope to finish by next year. Once that’s done, I intend to work and stay in Japan if possible. I’ll keep my fingers crossed for you. I do believe Japan is a beautiful country which offers photographers some great opportunities. So now let’s see a few of your photos that capture some of your favourite memories. 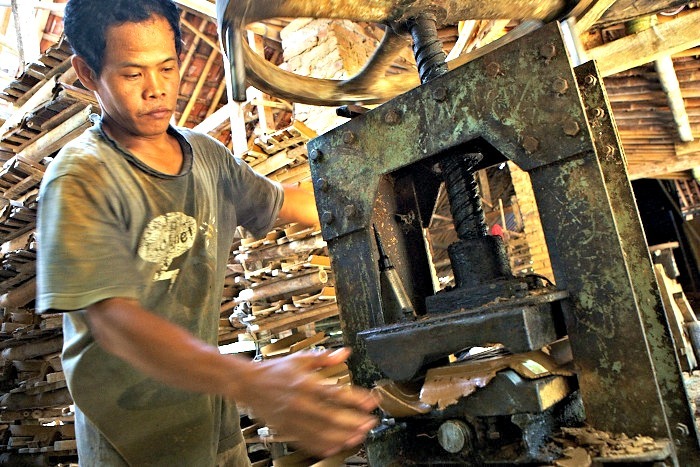 This Central Javenese man makes 500 tiles by hand every day using a cranky manual machine; photo credit: Jamie Chan. 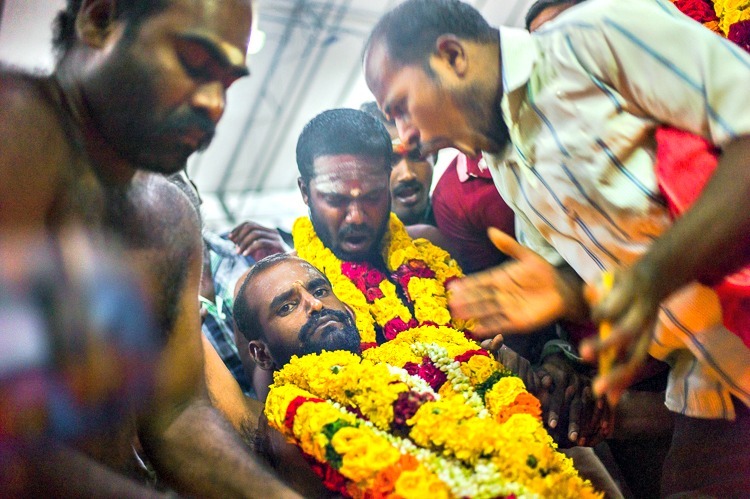 Singapore’s unforgettable Chetty Pusam; photo credit: Jamie Chan. Can Jimi the Human be real? Photo credit: Jamie Chan. 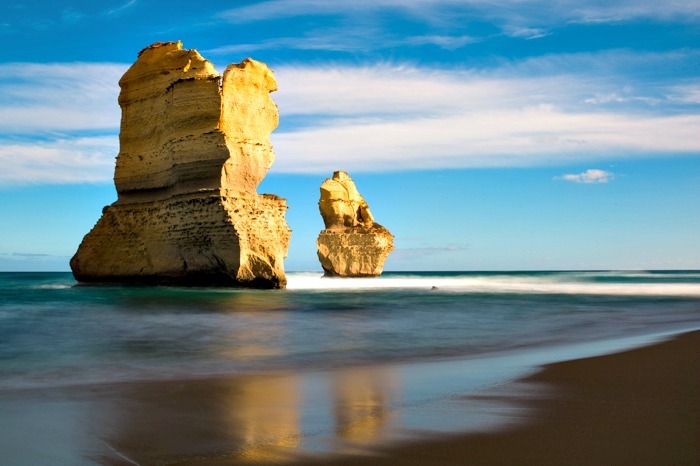 A couple of the Twelve Apostles along Australia’s Great Ocean Road; photo credit: Jamie Chan. This is a stunning picture, Jamie. You have made a simple composition with no clutter and very imposing subjects. I love it. One of Kathamandu‘s peaceful oases; photo credit: Jamie Chan. 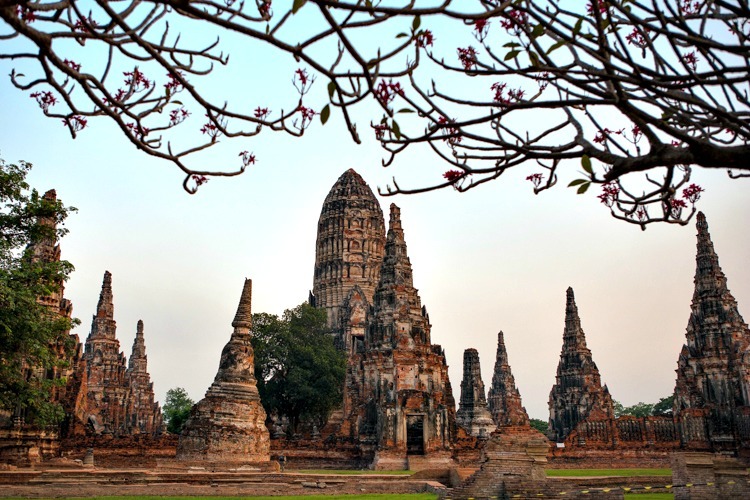 The ancient Siamese kingdom of Ayuthaya; photo credit: Jamie Chan. The more-than-a-thousand-year-old Khmer temples of northeast Thailand are really impressive and give us a glimpse of how the Khmer Empire stretched from Cambodia into what is now a large area of Thailand. Tell me, do you feel reserved about taking photos of people, particularly when they are conscious of you doing so? I try my best to observe and read a person’s body language. My camera is always with me and there is always a silent communication of sorts whenever I lift it to my eye. But there is actually nothing to feel reserved or shy about as the most that can happen is that your subject will say no or even hit you(!) if you are really obnoxious. I mainly do landscape but when I do shoot people I am the same. I hate to take “posed for” photos so I hardly ever get into a discussion. I take the pic or I don’t. 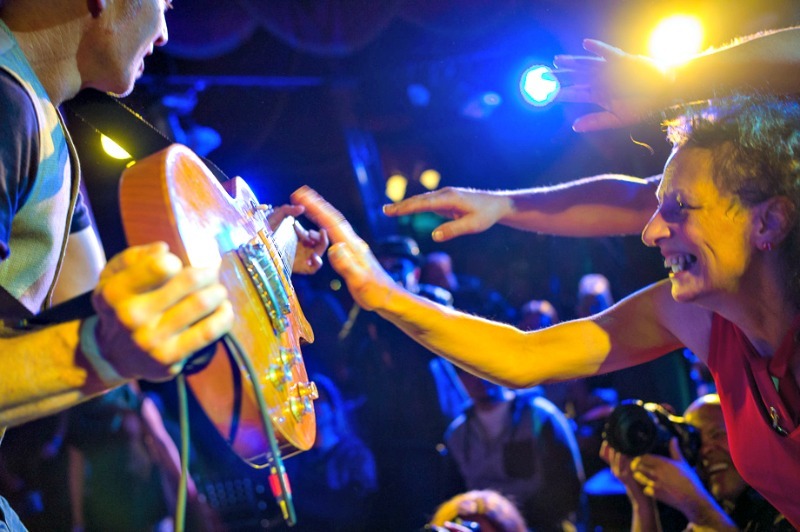 Do you ever ask permission before taking people’s photographs? How do you get around any problem of language? Since I am always reading a person’s body language before I shoot, I generally do not ask for permission. If I do ask and do not speak their language, I rely on improvised sign language—pointing to my camera and nodding with a big smile on my face. It’s worked so far. Yes, most definitely. As cliché as this may sound, the camera allows us to stop time for a split second and record the moment, preserve a memory. So when did you realise the power of photography, and how has it changed you? It happened by accident, like so many things in life, while I was looking through old photos of my family. I realised then that if no one had taken these photos, I would never have remembered how my mum looked like all those years ago. I know what you mean. For me, a picture is a diary of an event in visual form. The photographer “writes” about it in a way no one else could.Now for the technical stuff. What kind of camera and lenses you use? I work with a rangefinder, the Leica M-E. My 35mm Summilux lens is stuck to the camera body most of the time as it is just such a beautiful focal length which allows me to respond quickly to different situations. On certain occasions, maybe twice a year, I will use the 50mm Summilux just to get a tighter shot. Other than that, my iPhone 5s takes wicked macro shots. That’s interesting because although I have become attached to the versatility of my 18–55mm Canon lens there are times when I can’t get in close enough, so I need to add say a 70–200mm to my kit. And now I need an iPhone 5s!!!!! And which software do you use for post-processing? I use Lightroom for post processing as I shoot entirely in raw image format. Join the club. Finally, do you have any advice for wannabe photographers who are traveling or living abroad? I’m not sure what advice I can give for wannabe photographers, though that hoary old chestnut “Don’t quit your day job” has just now floated into my mind. I say that because I sense that the golden age of photography is mostly over. Having said that, if you have the passion and perseverance to live, breathe and eat photography, press on and live it. But also remember that technology has made it so much easier to learn a new creative skill. Try your hand at video, writing or music. Use your creativity, mash them all together, and see what you come up with. At the end of the day, as long as your art moves someone and you are able to live comfortably with what you have, you know you are on the right track. I actually think that is very good non-technical advice Jamie and I’d like to thank you for taking the time to tell your story so far in this interview. I am sure you will, undoubtedly, inspire other young and maybe not so young people. Editor’s note: All subheds are excerpted from Jamie’s blog. Readers, what do you make of Jamie’s experiences? If you have any questions for her on his travels and/or photos, please leave them in the comments! If you want to get to know Jamie and her creative works better, I suggest you visit her photography site and check out her posts on her photography/travel blog, No Foreign Lands. You can also follow her on twitter and Instagram and/or like her blog’s Facebook page. Love the positive can do anything attitude! Great post! Your comment is much appreciated. I agree, Jamie has a great attitude which will take her far.